Syrian Democratic Forces take position following a sniper shot in their direction on the eastern frontline of Raqa on 24 September, 2017. Beirut - US-led coalition strikes near the Islamic State group's Syrian stronghold Raqa in March killed at least 84 civilians, including dozens of children, Human Rights Watch alleged Monday. The group said the strikes hit two sites: a school housing displaced families in the town of Mansourah, and a market and bakery in the town of Tabqa. "These attacks killed dozens of civilians, including children, who had sought shelter in a school or were lining up to buy bread at a bakery," HRW deputy emergencies director Ole Solvang said. "If coalition forces did not know that there were civilians at these sites, they need to take a long, hard look at the intelligence they are using to verify its targets because it clearly was not good enough." HRW said the first of the two strikes was on March 20, and killed at least 40 people including 16 children at the Badia school in Mansourah. The second was on March 22 and killed at least 44 people including 14 children at the Tabqa market and bakery. The US-led coalition has been carrying out air strikes in support of anti-IS operations in Syria since September 2014, after expanding its existing campaign in neighbouring Iraq. 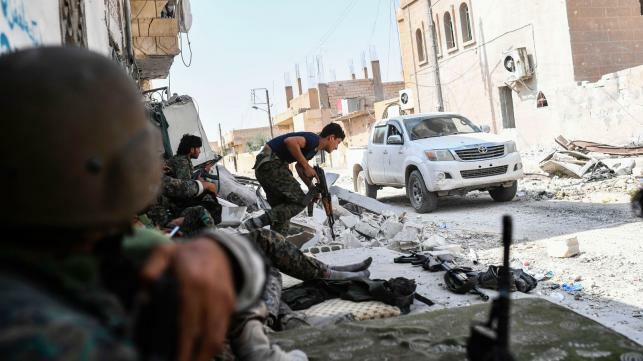 Since last November, it has been supporting the Kurdish-Arab alliance known as the Syrian Democratic Forces (SDF) as it battles to capture Raqa province, including its capital Raqa city. The SDF broke into Raqa city in June and is on the verge of capturing the former jihadist bastion. But activists have criticised what they say are disproportionately high civilian death tolls in the campaign. The coalition says it take all possible precautions to avoid civilian casualties and investigates credible reports of civilian deaths in its strikes. In August, it acknowledged the deaths of 624 civilians in its strikes in Syria and Iraq since 2014. But rights groups say the real figure is much higher, and HRW criticised the coalition's methodology for assessing civilian casualties. It said the coalition reported having assessed the Mansourah and Tabqa strikes, but it appeared they carried out no site visits nor witness interviews even though both places have been under SDF control for weeks. "If the coalition had visited the sites and talked to witnesses they would have found plenty of evidence that civilians were killed in these attacks," Solvang said. "The coalition should follow our lead, conduct full investigations, and find ways to make its civilian casualty assessments more accurate."